Back in 2011, everything ostensibly was coming up roses between Turkey and Egypt. In an interview that year, Turkish Foreign Minister Ahmet Davutoglu mentioned "an axis of democracy of the two biggest nations in our region [Turkey and Egypt], from the north to the south, from the Black Sea down to the Nile Valley." In September 2011, then-Prime Minister [now President] Recep Tayyip Erdogan found an emotional hero's welcome at Cairo's Tahrir Square. Tens of thousands of Egyptians had flocked to the Cairo airport to welcome him. Streets were decorated with posters of Erdogan. A 2011 survey by TESEV, a Turkish think-tank, found that Turkey was the most popular country for the residents of seven Arab countries, including Egypt. But against that glittering backdrop, this author wrote in June 2011: "For Ankara, Cairo can be the new Damascus until another capital becomes the new Cairo. At that time, Syrian President Bashar al-Assad, Erdogan's one-time best regional ally, had already become his worst regional nemesis. The Turkish-Egyptian love affair would, in fact, be quite short-lived. In August 2013, about a month after General Abdel Fattah el-Sisi in Egypt toppled the Muslim Brotherhood rule of President Mohammed Morsi, Erdogan appeared on TV and visibly cried while listening to a letter written to Beltagy's daughter Asmaa, a 17-year-old girl who had been killed in Cairo when security forces stormed two protest camps occupied by supporters of the deposed president. Poor Asmaa had been shot in the chest and back. "I believe you have been loyal to your commitment to God, and He has been to you," her father wrote in the letter. "Otherwise, He would not have called you to His presence before me." 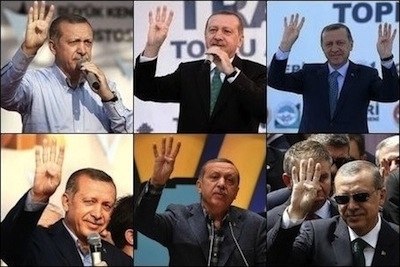 Later, Asmaa became another symbol for Turkish Islamists; Erdogan cheered party fans with the four-finger "Rabia" sign, in reference to his solidarity with the Muslim Brotherhood, and as a sign of his endearment for the unfortunate girl. Even on the playing field, a few footballers made the same sign after scoring. After the coup in Egypt, when el-Sisi ran for president and won the elections, Turkey's Erdogan declared them "null and void." And not just that. Erdogan also said that he did not view el-Sisi as "president of Egypt." At another time, he said, "Turkey would not recognize the coup regime in Egypt." Last July, he called el-Sisi "an illegitimate tyrant" and a "coup-maker." Meanwhile, neither was Erdogan a "rock star" in Cairo nor was Turkey "the most popular country." Egyptian non-governmental organizations [NGOs] called on Egyptians and Arabs to boycott Turkish goods and soap operas. Egypt's intellectuals, writers and businessmen were recommending a break in Egypt's relations with Turkey because "they were disappointed." Egypt unilaterally cancelled both visa-free travel for Turkish citizens and a transit agreement for Turkish trucks. In Ankara, Erdogan was all smiles when he offered a red-carpet ceremony to the visiting Qatari Emir Sheikh Tamim bin Hamad al-Thani. Happy to have his best ally as a guest, Erdogan probably did not know the Emir's next move on the Middle Eastern chessboard. In the unlikely event of a reconciliation, Erdogan's previous big words on el-Sisi the coup-maker will make him look like a leader shaking hands with an "illegitimate tyrant." A few days after al-Thani's merry visit to Ankara, Qatar announced its determination to thaw ties with Egypt, ending its alliance with Turkey over "Egypt's illegitimate tyrant." "The security of Egypt is important for the security of Qatar ... the two countries are linked by deep and fraternal ties," ran a statement from the office of al-Thani on Dec. 21. It was a real cold shower on Ankara -- and Erdogan. The statement had come one day after el-Sisi met in Cairo with a Qatari envoy, suggesting a possible thaw in relations. After the meeting, el-Sisi's office issued a statement saying, "Egypt looks forward to a new era that ends past disagreements." Apparently, the Egyptian-Qatari reconciliation had been brokered by Saudi Arabia and, once again, Turkey was the odd one out. In its immediate vicinity, Turkey does not have diplomatic relations with three countries -- Armenia, Cyprus and Syria -- and has deeply problematic diplomatic relations with two countries: Israel and Egypt. This situation is not sustainable. Even Deputy Prime Minister Bulent Arinc has said that Turkey should repair its relations with Egypt. But this is not an easy task. In the unlikely event of a reconciliation, Erdogan's previous big words on el-Sisi the coup-maker will make him look like a leader shaking hands with an "illegitimate tyrant." On Dec. 24, Turkey's foreign ministry spokesman said that bilateral ties with Egypt could "normalize if the country properly returns to democracy, if the Egyptian people's free will is reflected in politics and social life." Meaning, no normalization. The spokesman would not comment on Qatar's policy change on Egypt. Turkey aspires to be a regional leader with no, little or problematic dialogue with about a dozen countries in its region. Erdogan's top advisors have found a nice euphemism for this situation: "precious loneliness." In reality, it is rather a blend of miscalculation and over self-confidence.